Pasteur-plast pipets render liquid handling simple and safe. Cross-contamination and carry-over simply cannot occur so that tedious clean-ups are unnecessary. In addition, there is no danger of glass breakage with the resulting danger of infectious material escaping. 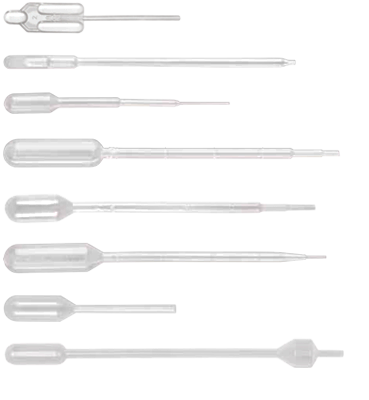 The pasteur-plast pipets are made of transparent polyethylene. They are inert to biological fluids and most acids. The low affinity of the surface reduces the loss of cells and valuable proteins through binding. 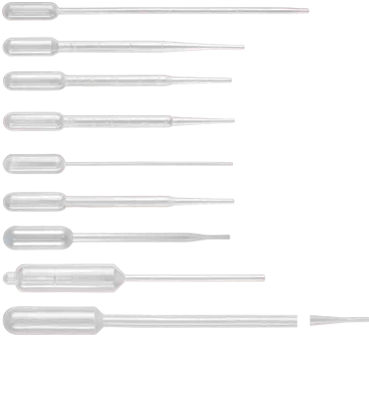 2600111 Pasteur-plast pipets, 3.0 ml Macro, 155 mm, graduated 500 pc. 2600119 Pasteur-Plast pipets 1 ml, 138 mm, graduated 500 pc. 2600120 Pasteur-Plast Pipetten, 1,5 ml, 230 mm 400 pc. 2600125 Pasteur-Plast pipets Mini, 0,5 ml, 87 mm ,graduated 1000 pc. 2600131 Pasteur-plast pipets, 2.5 ml, 150 mm, graduated 500 pc. 2600135 Pasteur-plast pipets, 2.0 ml, 153 mm, gr aduated 500 pc. 2600145 Pasteur-plast pipets, 0.2 ml, 130 mm 500 pc. 2600151 Pasteur-plast pipets, 3.0 ml Micro, 155 mm 500 pc. 2600155 Pasteur-plast pipets, 1.0 ml Capillary, 104 mm 400 pc. 2600160 Pasteur-plast pipets, 1.2 ml, 63 mm 500 pc. 2600165 Pasteur-plast pipets, 4.0 ml, 87 mm 500 pc. 2600171 Pasteur-plast pipets, 1.0 ml, 150 mm, graduated 500 pc.